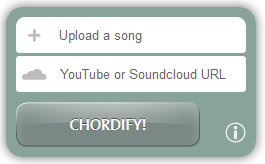 Chordify es una curiosa herramienta online que permite procesar archivos de música para extraer de forma aproximada los acordes utilizados en la misma. Además, podemos enlazar directamente un vídeo de Youtube como fuente de procesado. Los resultados son interesantes aunque no del todo precisos para algunas fuentes, pero la verdad es que es una tecnología que avanza a buen ritmo y que facilita la transcripción a partitura de cualquier fuente sonora. Un buen recurso que nos puede ayudar en más de una ocasión. Behind the scenes, we use the sonic annotator for extraction of audio features. These features consist of the downbeat positions and the tonal content of a piece of music. Next, a Haskell program HarmTrace then takes these features and computes the chords. For this to happen HarmTrace uses a model of Western tonal harmony to aid in the chord selection. At beat positions where the audio matches a particular chord well, this chord is used in final transcription. However, in case there is uncertainty about the sounding chords at a specific position in the song, the HarmTrace harmony model will select the correct chords based on the rules of tonal harmony.